I don’t know about you, but I love Indian food. Sadly, I don’t eat it very often. Maybe because nobody else in my family ever feels like going to an Indian restaurant. I love the naan bread and the curries! 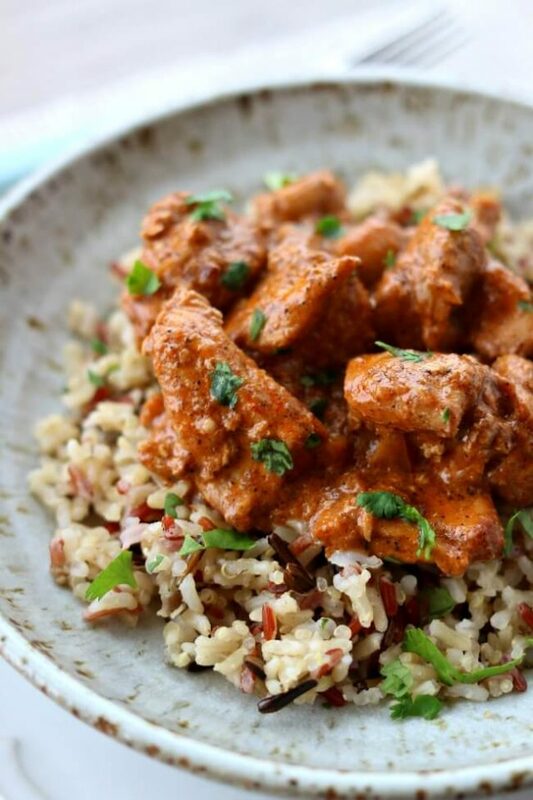 So, I decided to see if I could tackle an Indian restaurant favorite at home: Butter Chicken. 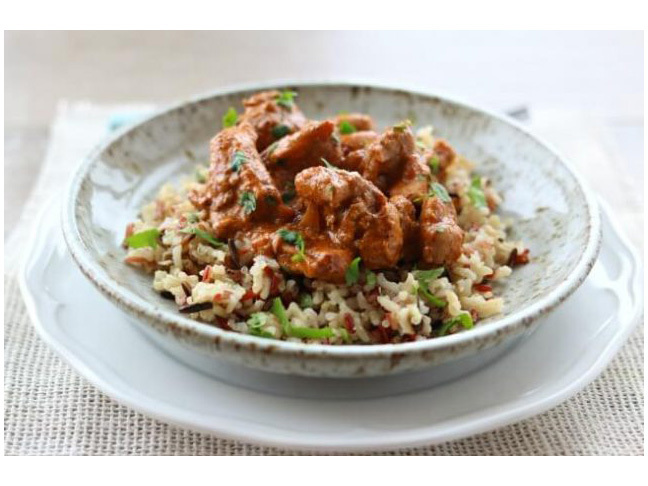 But of course, I wanted to make it Slow Cooker Butter Chicken. That’s just how I roll. I started the recipe by browning the chicken in a frying pan. I know, I know…this is a slow cooker recipe. But just stick with me, okay? If you can tolerate washing just one more dish, this small additional step is totally worth the extra effort (it makes the chicken so flavorful!). The chicken is browned in a mixture of butter and vegetable oil and then the same oil is used to make a flavorful sauce of sautéed onions, tomato paste, garam masala (an Indian spice), garlic, and ginger root. Everything then goes into the slow cooker for 4 to 6 hours (on low). Add in a bit of cream and garnish with cilantro before serving — and get ready for an amazing meal! 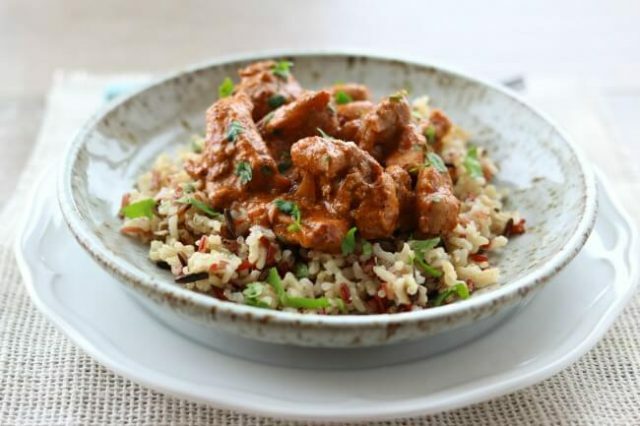 Tender and moist bites of chicken in a mildly spiced curry sauce made at home in your slow cooker. Pair it with some rice and naan bread and you’ll feel like you’re at your favorite Indian restaurant. 1. Heat a large skillet over medium heat. Add in the butter and oil. When butter is melted, add one layer of chicken (you may need to work in batches). Let the chicken brown on one side for 5 minutes. Turn the chicken and let it brown on the other side for 5 minutes. Use tongs or a slotted spoon to transfer the chicken to the slow cooker. 2. Add onions to skillet and cook until they are soft and translucent. Add in the garlic, ginger root, garam masala, tomato paste and salt. Cook for another 2 minutes. Stir every so often. Add the chicken broth and scrape the bottom of the pan with a wooden spoon. Transfer contents of pan to the slow cooker. Stir a bit to cover the chicken with the sauce. 3. Cover the slow cooker and cook on low for 4-6 hours. Gently stir. Add in half and half and gently stir to combine. 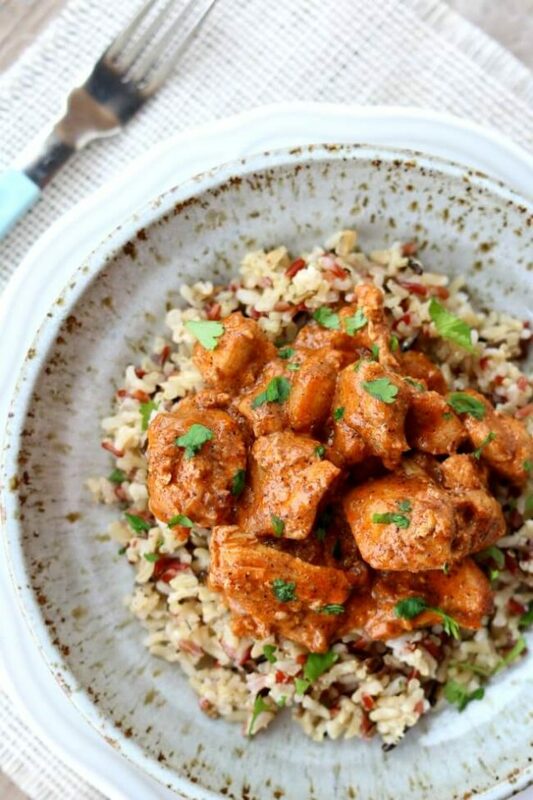 Spoon chicken onto serving plates and top with the cilantro. Serve the chicken with rice or naan bread. Note: For best results, prepare in a 3-quart slow cooker.